The Library Group Study Rooms are available for use by registered Trent undergraduate and graduate students for group study or projects relating to a Trent course. 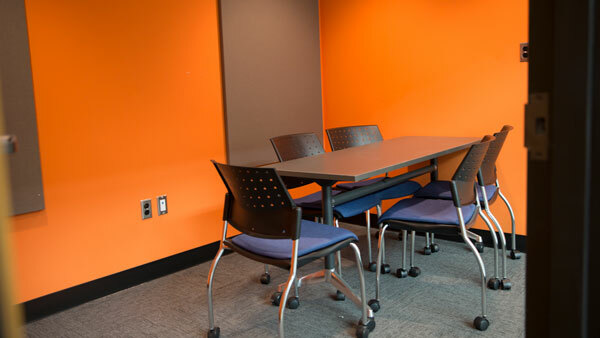 Bata Library has twelve group study rooms and one presentation practice room; the Durham Library & Learning Centre has two group study rooms. Group study rooms are booked online via MyTRENT and instructions are below. See the Guidelines on Group Study Room use. Problems with booking? See Failure Message in the left menu. Questions or comments? Contact library@trentu.ca or ask at the Library Service Desk. Book a Group Study Room in the Bata Library or Durham Library & Learning Centre using the University's "Room Booking" system. Find a link in myTRENT, under "Services", or at the top of this page. Click "Log In" at the top right of the screen. Use your myTRENT username/password to login. The Library rooms are listed in the Self Service section; look for it on the left side of the page. Enter dates and times to find available rooms. View all bookable rooms, check their availability. You'll see a message if your request is not successful. Contact library@trentu.ca with questions. To see your reservations, check My Self Service or My Bookings. All your current bookings are displayed. Cancel a booking from here. Beside each reservation there's a "Cancel" button. Click to cancel. Use this option when you know WHEN you want a room, but you're not fussy on which room. Select "Library Group Study Rooms", and your prefered library. Select a date on the calendar provided. A list of timeslots with available rooms within your range is provided. Click a timeslot for a list of rooms available. Click "Detail" to learn more about the room. View the room's availability by month, week, or day by clicking a "Calendar" link. Click a row (room) to make your selection. A pop-up window appears: click "Proceed". Choose this option if you want a particular room, but the time is flexible. All the Library Group Study Rooms are displayed. Click "Detail" for a room to learn more about the room. Select a room by clicking on the row. If you select anything higher than 01:00, you'll receive a failure message. Click "Verify Calendar" to select a date. A list of available times that meet your criteria is displayed. Click "Book" beside your preferred slot. After you "Book", a confirmation screen displays. Select the number of people in your group. Provide a name for your group (at least 4 characters required). This is helpful when several group members want to book the room consecutively. The room is booked and a confirmation message is sent to your email. If the booking cannot be made for your requested room and time, the general message presented is: "Room is unavailable based on the selected parameters or institution rules." You're requesting a booking longer than the maximum: 1 hour per person. Scroll your mouse over the message to see, "You cannot book more than 01:00 hour per day." Each member of your group can book one hour per day (Bata) or 2 hours per day (Durham). Each student is entitled to a maximum of one hour per day. You've requested a time when the Library (or the room) is not open. Scroll your mouse over the message to see, "Room not available." The room is already booked for that time. Scroll up to check the schedule beside the room number. See the Guidelines for information about restrictions.